DETROIT, Michigan, January 14, 2014 (ENS) – The North American International Auto Show (NAIAS) opened in Detroit’s Cobo Center Monday for the first of two press days, to be followed by two industry preview days and a charity day before Detroit’s premier auto event opens to the public on Saturday, January 18. It runs through Saturday, January 25. “Whether you’re a true technophile or a fan of good, solid family cars, trust me,there are plenty of vehicles out there to capture your imagination and meet your driving needs. It’s also a testament to the advances being pioneered that make nearly all vehicles cleaner, greener, and – most importantly – safer,” said Foxx. The 18th Annual Urban Wheel Awards is the “Official Multicultural Event” of the North American International Auto Show. The annual Urban Wheel Awards honor companies, executives and suppliers for recognizing the growing multicultural consumer and embracing diversity in operations and mission. The all-electric BMW i3 has been selected as the 2014 Urban Green Vehicle of the Year. The Urban Vehicles of the Year multicultural/multi-gender judging panel includes some of the most notable and respected automotive reviewers in the country, such as Motorweek’s Yolanda Vazquez, Frank Washington of AboutThatCar.com, Camilo Alfaro of Autoproyecto, and Ken Panton of eCityofStyle. On view from today is the eGolf, Volkswagen’s first entry into the rapidly growing electric car market, due to go on sale in selected states in the fourth quarter of 2014. Volkswagen has stated that it aims to be the world leader in e-mobility among automakers by 2018. Although Volkswagen has sold more than 30 million Golf models worldwide, this is the first zero tailpipe emissions, fully electric version of the car that will be sold to the public. The e-Golf is available in five-door form only and is recognizable by its unique aluminum-alloy wheels and by its LED headlights, the first time they have been used as standard on a U.S.-market Volkswagen. The e-Golf is powered by a 115-horsepower electric motor powered by a lithium-ion battery. From a standing start the e-Golf reaches 25 miles per hour in 4.2 seconds and gets to 62 mph in 10.4 seconds. Top speed is electronically limited to 87 mph. Depending on driving style and charging behavior, the average range for the e-Golf is between 70 and 90 miles. When the car is not in use or in the event of a collision, power from the battery is automatically cut off. There are several different ways of charging the e-Golf’s battery – a 220-volt wallbox for a garage or carport, charging a completely flat battery in less than four hours. The DC Fast Charging infrastructure allows the battery to be charged to 80 percent in around 30 minutes. Or drivers can plug into a 110/120-volt electrical socket, which takes around 20 hours to charge the battery. The e-Golf has two technologies that allow drivers to control energy use; three driving profiles designed to preserve energy Normal, Eco, and Eco+; and three different levels of regenerative braking. Volkswagen tailored the acoustics of the e-Golf for an electric vehicle, making it an almost silent cruiser. 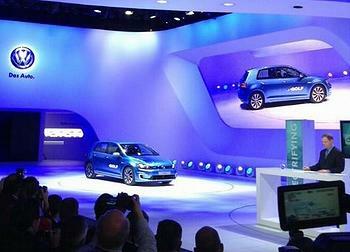 To help pedestrians hear the silent vehicle coming, the e-Golf has a low-speed sound system. The touchscreen in the center console is equipped with a range monitor that displays a graphic illustration of the vehicle’s current range. The impact that auxiliary components such as the air conditioning or heater would have on range is also displayed – the driver can gain additional range by switching these off. The energy flow indicator on the touchscreen depicts the energy flow when accelerating and when regenerative braking is happening. Regenerative braking stats show the amount of energy recovered since the start of the journey. The e-manager enables drivers to pre-program up to three departure and charging times. The e-Golf features as standard a new assistance system called the Automatic Post-Collision Braking System that helps drivers avoid a second impact after an initial collision. Volkswagen will offer a Roadside Assistance Plan designed to take the anxiety out of “range anxiety.” If a driver runs out of charge and is within 100 miles of home, Volkswagen’s Roadside Assistance provider will deliver the car to a nearby and convenient source for charging and will even pay for the customer to take a taxi home or to work. The Honda FCEV Concept is on display at NAIAS, after making its world debut at the Los Angeles International Auto Show on November 20, 2013. The Honda FCEV Concept features sweeping lines and an ultra-aerodynamic body. It seats five adults, due to new powertrain packaging efficiencies. The concept car hints at Honda’s next generation of fuel cell vehicles, which are expected to launch in the United States and Japan in 2015, with Europe to follow shortly. Since the former Detroit Auto Show became the NAIAS in 1989, it has been visited by United Nations delegates, scores of U.S. Congressional representatives, a Japanese emperor, a Russian Ambassador, several White House Cabinet members, and one U.S. President, Bill Clinton in 1999. This year, as the show celebrates its 25th anniversary as an international event, Vice President Joe Biden will visit on Thursday, January 16. Several members of the U.S. Congress, along with representatives from Canada, China, Italy, Japan, and Mexico also are expected to attend. Detroit’s new mayor, Mike Duggan, toured the show floor last Thursday during the move-in to Cobo Center. 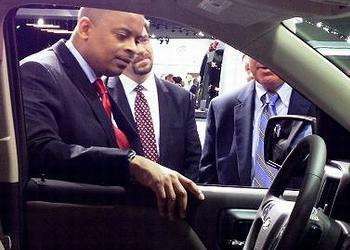 The NAIAS also serves as a venue for automotive events that help to develop and influence legislative policy. This year on January 15, the show will be the setting for two legislative hearings – one by the Michigan Senate’s Economic Development Committee, and the other by the Michigan House Commerce Committee. Industry testimony will seek to educate lawmakers on Michigan’s role in the global automotive industry and what Michigan can do to attract automotive investment. Experts including Michigan’s senior automotive adviser Nigel Francis, MICHauto’s Rob Luce, Nissan’s Carlo Bailo, Magna International’s Scott Paradise and others will testify before the committees on issues that affect Michigan’s automotive industry.